Information about taking care of pet chinchillas. Looking after a chinchilla requires time, understanding and commitment. Below, you will find information about caring for your pet chinchilla, the cage, sand bath, how to hold a chinchilla, making friends with a chinchilla and their description and origins. There are separate pages about Feeding your chinchilla and a page on some Health problems Chinchillas are now becoming very popular pets, however, it is well to remember that some can live for 20 years plus, although their average life span is usually about 12-15 years. So, if you do not have time for a long-term pet then a chinchilla is NOT for you. Please remember too, veterinary care can be very expensive should your chinchilla require it. Chinchillas are usually referred to as being nocturnal, a better description would be to say they are 'crepuscular' which means they are active during the twilight hours (dusk until dawn). So they sleep during the day and become more active at night. A chinchilla is easy to look after, rarely aggressive, very clean and has practically no smell at all. But again, this pet needs a lot of your attention every day. Chinchillas are not always the 'cuddly' type of pet you might expect. Some chinchillas like to be handled, while others do not ike to be held too much. Many do not like to be over handled. They are all very individual with different characters. But, they are usually friendly and although many do not care to be picked up a great deal, they will enjoy a good scratch and stroke while standing on their own ground. They are very inquisitive too, so are often happy to jump up on to you. The correct environment for your chinchilla is also very important. A chinchilla's cage should be kept in a quiet, cool, but not draughty area of the home. See more below. Chinchillas require a high fibre diet - Please see separate page on Feeding Description These beautiful creatures are members of the rodent family. The Latin word for rodent is rodere which means 'to gnaw'. Fully grown chinchillas are about 12 inches (30cm) long and can weigh between 500 - 700+ grams, the female usually bigger than the male. Sizes can vary quite a lot. A chinchilla is similar in size to a small rabbit with squirrel-like tails. Their fur is so dense that they do not attract fleas. Chinchillas have more fur per square inch than any other known animal. The Cage Make sure that the cage is big enough. 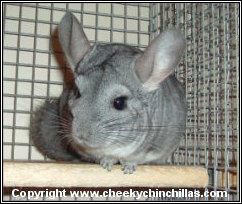 One chinchilla can be kept in a cage approximately 90cm high x 60cm wide x 45cm deep. Cages should remain indoors unless kept in a purpose built, secure outer building. He/she should also have a run outside of the cage for approximately one hour each day. Many chinchilla cages are made of galvanised wire mesh, with a pull out tray for cleaning. The floor is wire/mesh too. These cages are referred to as 'Thickets' type cages.The shelves in the cages are usually made of untreated pine. As the flooring is made of mesh, it's a good idea to place some small pieces of untreated pine on the bottom of the cage too. 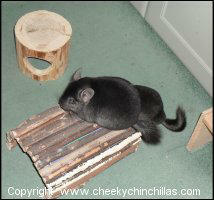 Chinchillas can play on these and it also creates a softer area for them to rest on. If chinchillas are on a wire/mesh flooring all the time, they can get sore feet. Untreated, kiln dried pine is safe, as long as it does not contain any phenol oils etc. Phenol oil is part of the sap that is left in the wood after a quick drying process has been used. Some people place pieces of Polar Fleece on the wire mesh to provide a softer floor area. Polar Fleece is ok to use because it does not thread like cotton, so most chinchillas will not chew it ... although some might try. There should be a wooden box, for the chinchilla to sleep or hide in and suitable 'play' items. Chinchillas don't use bedding as such - they are happy to sleep in their wooden box or on a shelf. As mentioned earlier, Polar Fleece is ok to use in boxes or on the floor of a wire-bottomed cage to provide a softer area, to protect their feet. Chinchillas can get sore feet if they are on wire all the time. Fleecey hammocks and tunnels are also popular. There should also be a water bottle, hay rack and a bowl for food. Heavier bowls are better to use, as they are not so easily knocked over. Chinchilla food bowls are usually the earthenware type, although you can buy some made from stainless steel. Plastic bowls should not be used as this would be harmful to the chinchilla if he chewed it. See Feeding Chinchillas do not like a lot of noise so the cage should be placed in a quiet environment that is well ventilated but not draughty. During hot spells of weather, make sure the cage is shaded from bright sunlight and that there is a constant flow of cool air. Chinchillas do not like to be too hot and can suffer from heat strokes . Temperatures above 75ºf can be fatal to chinchillas. 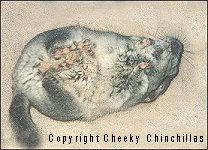 The Sand Bath Chinchillas do not bathe in water but sand (also referred to as dust). In the wild, chinchillas will bathe in volcanic ash. You can buy chinchilla dust from a reputable pet shop. They need to bathe/roll in the sand to clean and look after their thick coat. I allow my chinchillas to have a bath every evening, when they are out for their run. Do not leave the sand bath in the cage ... if used too often, their skin and coat might become too dry. I use the Sepolita Chinchilla Dust Cleaning Although chinchillas do not smell, the cage should be cleaned out at least once a week. Clean down shelves and boxes etc everyday. Hygiene and cleanliness are very important. Left over food, mouldy hay, droppings in food and stale water can cause bacteria to form which can be harmful to your chinchilla. Many cages have a litter tray at the base which you can pull out to place in sawdust, paper etc. Some people use wood based cat litter, but this should never come into contact with the chinchilla and only placed in the tray below the wire, out of reach. General Chinchillas need to keep their teeth trimmed and so will try to chew almost anything. For this reason chinchillas can not have the run of the house like a cat or dog. Also, let everyone know when your chinchilla is having a run. A good safety feature is a door hanger to say when your chinchilla is out of the cage. There have been many incidents where chins have been stepped on. As chinchillas will try to chew many items, avoid anything made of plastic and do not let them chew anything which is painted or stained. Plastic, paint, stained wood etc can all be toxic. If they try to chew any of these things, they might ingest some and this could cause serious heath problems ... even death. You can buy a variety of wooden items for them to chew, from a pet shop or on line. Willow Sticks, Bark Bites, Cholla Rings and Apple twigs are often the ones available in the larger pet stores. Chinnies love chewing willow and stripping the bark off apple twigs (see pic below) N.B. If I buy the willow sticks, I always cut them into smaller lengths of approx 3". This makes it easier for the chinchilla to hold. Also, as chinnies sometimes chew them to a 'point', I feel it could be dangerous if they are left too long a length .... Afterall, you wouldn't put a sharp wooden skewer in a cage! Always remove any 'sharp' looking chewed wood. Cholla, pronounced 'choya' is a type of cactus. When sundried it makes a great natural chewing toy for chinnies Apple twigs, after a chinchilla has stripped off the bark The digestive system of the chinchilla is very delicate, therefore, it is important that they are fed the correct diet. Chinchillas require a high fibre diet which helps to keep their digestive tract healthy. Looking after your chinchilla's teeth and providing items he can chew is very important. More about this on Feeding and Health pages. 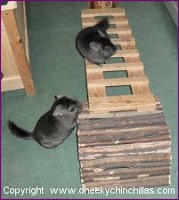 Chinchillas can jump very high, so again, they should always be supervised. While playing outside of their cage, they are quite capable of jumping onto a ledge that is a metre high or more, or across from one ledge to another. 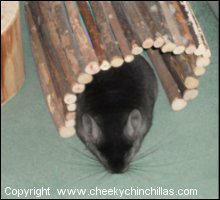 Cardboard tubes provide entertainment for chinchillas, but they should not be a substitute for suitable wooden chews. Chinchillas will shred card and in doing so they may ingest some. A little won't harm, but a lot could cause blockages. Making Friends with Your Chinchilla Sometimes it can take a while for a chinchilla to get used to you, especially if he hasn't been handled very much. Some chins like being held more than others. Not all are the ‘cuddly’ type. But persevere ... they need time to trust you and it can take a while. They need to feel safe and secure. Start by placing your hand in the cage and letting the chinchilla smell you. After a while, if he seems happy with this, try giving him a scratch behind and around the ears - they love this. When he seems more settled, provide a safe area in your home to let him have a run. BUT remember, chinchillas will try to chew almost anything. So, if you let your chinchilla out of the cage for a run, it is very, very important that you provide a 'chin-proofed' area. Apart from the damage he might do to your furniture etc, plastic, paint, varnish, glue can be toxic to chinchillas and could cause serious health problems, even death if they ingest any of these substances. Not to mention, of course, electrical wiring etc Always supervise him. They can jump quite high and they always want to be where they shouldn't be. So, never leave him alone for a moment. Another good way to make frinds with your chinchilla, is to sit with him while he is out for a run. Again, do not let him near anything that could harm him or he could damage...he will try to chew anything. Sit with him on the floor...Chinchillas are curious and he will probably jump onto you and investigate. Try not to move too suddenly and do not grab at him. If you try and grab a chin he will shed fur, basically as a means of escape; this goes back to their origins, when they would escape predators. See if they will come to you if you offer him a small healthy treat. Holding your chinchilla : When you think he is used to you, you can try picking him up. Do this very gently and hold him with both arms. Chinchillas like to feel secure, so don’t hold him over mid air, keep him close to you and support his back legs. This all takes time and patience but it is worth it :-) Always talk quietly to him - they don't like loud noises. There is no need to tip toe around - just not be too noisy. But again, always remember, when your chinchilla is out of his cage, keep him away from wires etc and your good furniture! Chinchillas like company – if you have a few chins, they will play with each other, but one chinchilla on his own needs more attention. Provide plenty of activities and be interactive with him. How Big is a Chinchilla ? These beautiful creatures with their large eyes, long, thick fur and bushy tails are about 12 inches (30cm) long when fully grown. The female is usually larger than the male. Chinchillas weigh approximately 500 - 700+ grams. This is just a rough guide as their weight can vary quite a lot. 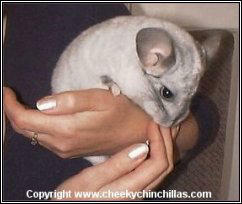 To give you a better idea of the size, below is a picture of a chinchilla being held. Origins Chinchillas originate from the rocky mountain range of the Andes in South America. Discovered by Spanish explorers in the 1500's, they were named after the Chincha Indians, who through necessity to keep themselves warm and have food to eat, used them as a source of food and made clothing with their fur. Later introduced to Europe, their soft luxurious fur became very popular and was sought after so much, it nearly caused their extinction, as literally millions of chinchillas were killed for their pelts. It is very distressing to know that it takes well over a 100 chinchillas just to make one coat! Today, hunting the wild chinchilla is banned and they are protected by the Convention on International Trade of Endangered Animals. Mr M.F. Chapman, is responsible for the domestication of the chinchilla. He worked as a a mining engineer in Chile. In 1923, after finally getting permission from the Chilean Government, he transported 11 chinchillas to California. They bred successfully and were originally sold to fur ranches and then later sold as pets. It is more than likely that most of our pet chinchillas today are descended from Mr Chapman's original eleven.